Infiniti Telecommunications is an Australia-wide telecommunications company. It provides telephony systems to small, medium, and large businesses and delivers ongoing customer support post-sale as well. The service team, who carry out the installation, maintenance, and servicing of the phone systems the company sells. Simply Headsets, the largest online retailer of business phone headsets in Australia. Both of these units perform unique functions, and Customer Thermometer is used differently in each, yet serves the same final purpose: to obtain and analyze customer feedback in real time for the purposes of quality control, reputation management, and drive the enhancement of online reviews. The service department consists of at least one ground tech in each state who perform the installation, maintenance, and service of the company’s phone systems, plus two service managers in Infiniti’s head office. The service managers coordinate and schedule technicians based on the jobs that need to be done and their priority. 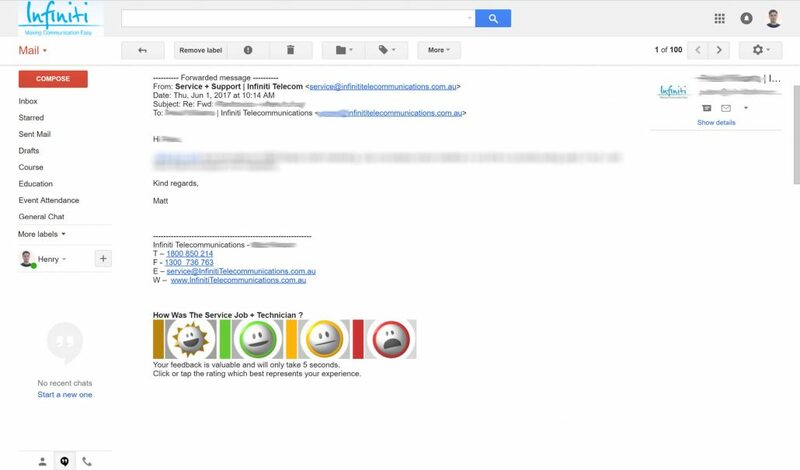 Both managers and technicians work in Gmail, so Customer Thermometer is embedded in their email signatures. Therefore every email they personally send, offers the customer an opportunity to provide feedback. However, not all emails are sent personally. 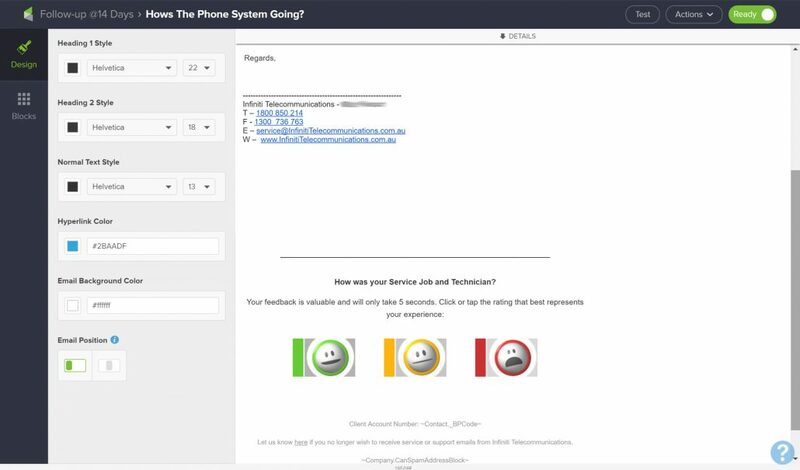 Follow-up emails after installs and service calls are automated through Infusionsoft, a CRM software often used by small and medium size businesses. Infiniti have made a conscious decision to only automate follow up emails that the team would have personally sent given all the time in the world. They have made an effort to make their automated email signatures inside the CRM look the same as their personal Gmail signatures. Using the new Infusionsoft Email Builder, the Customer Thermometer icons are added to the email signatures in each of the automated emails. 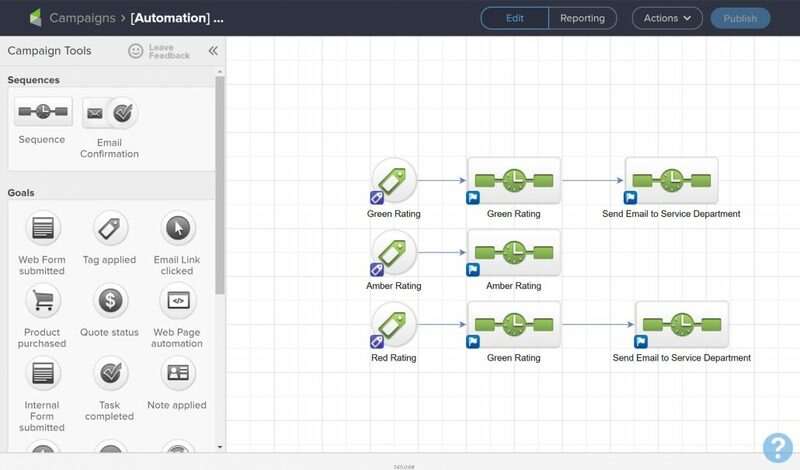 Automations are set up based on which reaction a customer clicks on in the email. There are three possible results, okay or middle feedback, negative feedback, or good feedback . An “okay” answer does not trigger an automation at all. Usually customer feedback is either good or bad, and does not fall into this middle category. On the rare occasions it does, typically no response is needed. A negative answer triggers an automation that lets the service team know about the response and prompts them to take action to correct the issue whatever it may be. The appropriate team member follows up with the customer directly. This has two effects. The first is that the customer is allowed a chance to clarify the problem, and the company gets a chance to correct any missteps. The second is that an immediate response often intercepts the customer feedback before they leave a negative review online, and lets them vent in a more controlled manner. A positive answer triggers a two-fold automation as well. First, it directs the customer to a thank you page where they are then asked if they have a few minutes to leave a Google review. The second part of the automation triggers an email to the team to let them know they’ve done a good job . Customer Thermometer worked so well with the service teams, Infiniti Telecommunications decided to roll it out across Simply Headsets as well. Customer Thermometer is included in all personal and automated emails just like it is with the service teams. The difference is that Simply Headsets gets a lot of customer enquiries through email as well as phone from customers seeking advice about what headsets to buy, and which ones will work best for their business with the phone systems they have. This makes it possible for Simply Headsets to gain feedback on the process early on and throughout the purchase process. Having a way for customers to leave feedback so easily helps everyone improve. 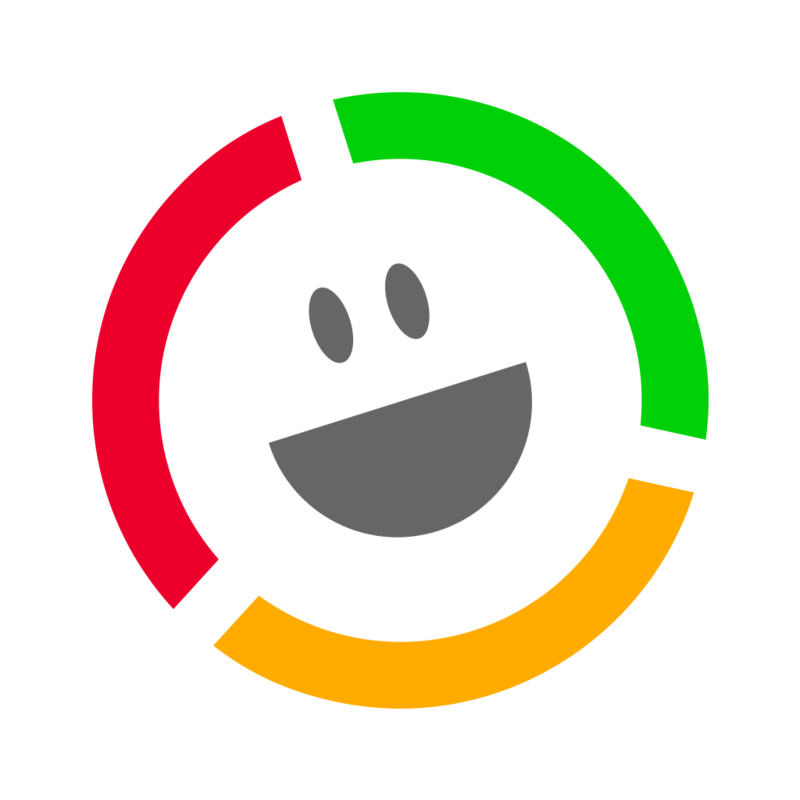 The biggest advantage to Customer Thermometer is that the simple icons offer customers a way to leave feedback without a big time commitment. It takes almost no time for them to simply click on the icon that describes how they feel about their experience. Initially, they can do this without having to talk to a person. The feeling of anonymity empowers the customer to be honest and direct in instances where they might not be in person, whether their feedback is negative or positive. Customer Thermometer also offers an intercept point: negative feedback can be addressed, and customers feel they have had their say without needing to take the rant or the review public. Positive feedback offers an opportunity to thank the customer and ask for a review elsewhere, an easy way to capture a good attitude immediately after an experience. Customers are more likely to leave a good review if they are invited to, and this offers an opportunity to issue that invitation. Infiniti Telecommunications partnered with SpringCom who offer services Infiniti do not. Infiniti embed their own Customer Thermometers inside the SpringCom customer service emails for the customers they share. 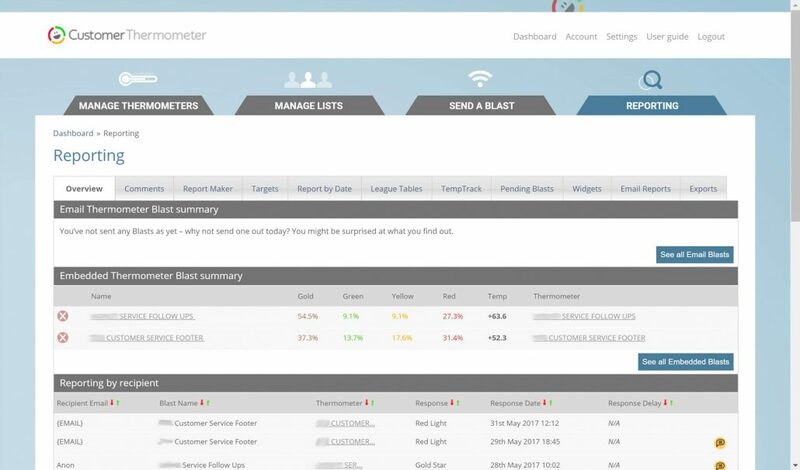 Infiniti uses the Customer Thermometer dashboard & reports to analyze the feedback SpringCom receive. This helps them see how joint customers are being treated and how they feel about their experience with a partner company. 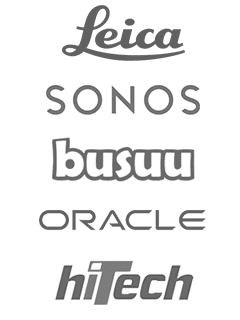 This allows both companies to improve. If there were to be any major issues, Infiniti has access to Customer Thermometer reports that would allow them to dig deeper and resolve problems before they get any larger. Infiniti Telecommunications is able to use Customer Thermometer to quickly and accurately gather feedback from their customers in near real time, and because of the success they have had at deploying it with their service teams chose to roll it out to another one of their companies, Simply Headsets. The automation lets the team know what kind of job they have done, and if they need to follow up with the customer. In the case of negative feedback, issues can be quickly resolved before the customer leaves a bad review. In the case of good feedback, the customer is asked to leave a positive review and the team is congratulated for the good work they have done. Even in working with a partner, Infiniti can discover how customers are being treated, and resolve issues before they become a problem. Gathering customer feedback and responding quickly to it is an important part of Infiniti Telecommunications business model. Customer Thermometer’s telco customer survey makes it easy for customers and for the company, and that’s a win for everyone.